OK so you want less wires and all those USB cables and Apple wires make a mess. Now you can get this super small 30pins dock connector that has a micro USB port in the back so that you can use it with a standard USB cable. And this makes it easier to get rid of cables. 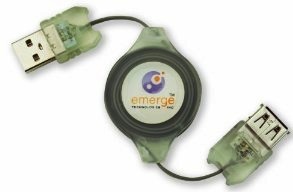 This connector is really small and that makes it the perfect solution for your cable problem. Come have a better look at this Compact 30 Pins Doc Connector With Micro USB. Extension cables are either to short or to long but never the right length. That is till you found this retractable USB cable that will become the length you want it to be. This retractable USB cable can be anywhere between nothing ant 3.2 feet. It’s simple just pull it to the length you want and you are ready. Then pull lightly and you can retract it again to make it shorter or longer. A cable like this should be living in any once laptop bag. This wire is USB 2.0 compatible and will support data rates up to 480 Mbps. Stop using the wrong cable and start using this USB Retractable Extension Cable. Our Apple devices are great but why do we get such a boring sync cable? But this cable can change that for ever. This sync cable is yellow with a blue USB plug and a red 30 pins Apple plug. This wire will bring color to your iPad, iPhone and any other Apple device that uses that cable. Now you will never use the wrong cable because the color will help you find you way. Go check out how this Colorful Sync Cable. No this is not a USB banana but it looks like it doesn’t it. 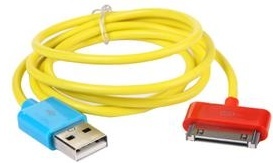 If you want to make fun of some friends then the USB-IT cables (set of 2) will help. Now you can make anything USB because this is a USB wire with a double sided sticky tape so you can just stick it to what ever you want. 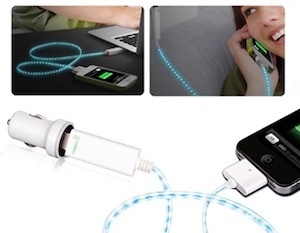 Want a USB you then just connect it to you. 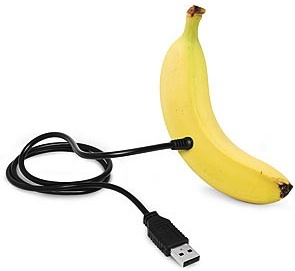 Or maybe you really want to show the world a USB banana so just make it with the USB-IT. 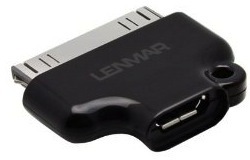 Make it better by plugging it in to your USB port and make you story so that it is perfect. Go check out the USB-IT stick on USB Cable. So you got that nice flatscreen TV and now it hangs on the wall with a lot of cables below it being ugly. No worries just get some of these low voltage cable plates and soon you will be able to hide all those ugly cables in your wall. This will make your install look so much better and it is so simple that you wonder why I didn’t think of this. Go check out this Low Voltage Cable System. Sick of carrying all those different patch cables in your kit? 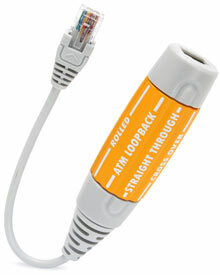 Now there is an solution for that with this Universal Network Cable. Doesn’t that sound nice to have? It has a place in my kit from now on. We all know the problem, your router is on one side of the house and your network printer that does not have WIFI is on the other side. So now you can start drilling holes in your home and pulling wires but that is such a pain. 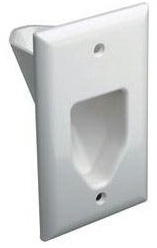 So why not look at the MegaPlug? It offers two power plugs in witch you can put a network cable that way you can stream your network over you power system, it can reach speeds up to 85 Mbps and that is enough for most network tasks. 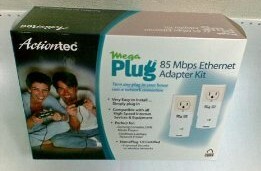 Have a look at the Actiontec MegaPlug 85 Mbps Ethernet Adapter Twin-Pack and see what other people think of this amazing product. USB 3.0 is still new lets say really new. There is not to much available but this can change soon really soon and then we need to replace all our USB wires for the new 3.0 version that of course is much much faster. But no worries because we already found some cool blue USB3.0 cables. Get your Syba USB 3.0 Cable today and your future can start.